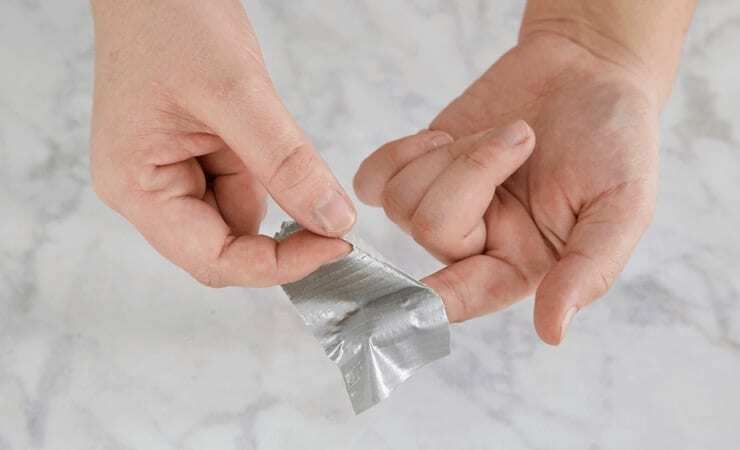 There are many essential items that we keep around the house in case of need, but perhaps none of them is quite as useful and popular as duct tape. Invented in the early 1900s, this product is a cloth-backed, waterproof adhesive tape, and it can stick to almost any material. While you can probably find it in every home, not everyone are aware that this product has hundreds of original ways you can use it. Aside from just taping things together in the traditional sense, there are so many things you can do with duct tape. Whether it’s maintaining your home, fixing things, solving common household problems, or even making artful creations. The possibilities are endless. 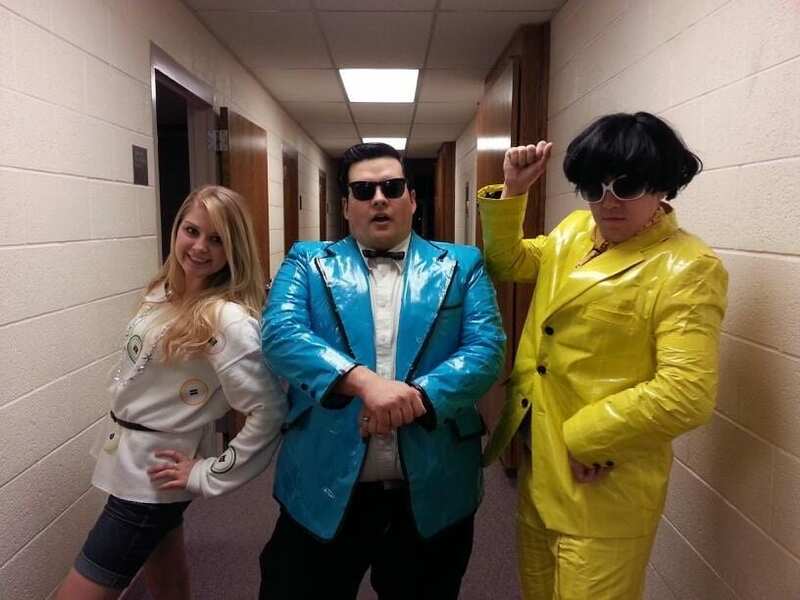 The “Duct Tape Guys”, Jim Berg and Tim Nyberg, are two men who are firm believers of duct tape. They came up with a philosophy that says you only need two things in your tool box – duct tape and WD40 (a lubricant used to separate other materials). They even wrote seven books on the different uses of duct tape, which is far more than we could’ve imagined. These hacks are so ingenious and clever, we plan to use them to solve some of our own problems around the house. Who knew that duct tape had so many different uses? We sure didn’t, but now we do. So read on to find out what else you can do with duct tape, that never crossed your mind. Have you ever tried opening a jar, but it just won’t budge? You try and try, but it doesn’t seem to be working? It can really hurt your ego to think you’re not strong enough to do it. But the truth is that sometimes these jar lids become so jammed, even Arnold Schwarzenegger himself couldn’t open them. A clever duct tape hack you can use is attaching a piece of duct tape to the top and side of the lid, and twist it as hard as you can. 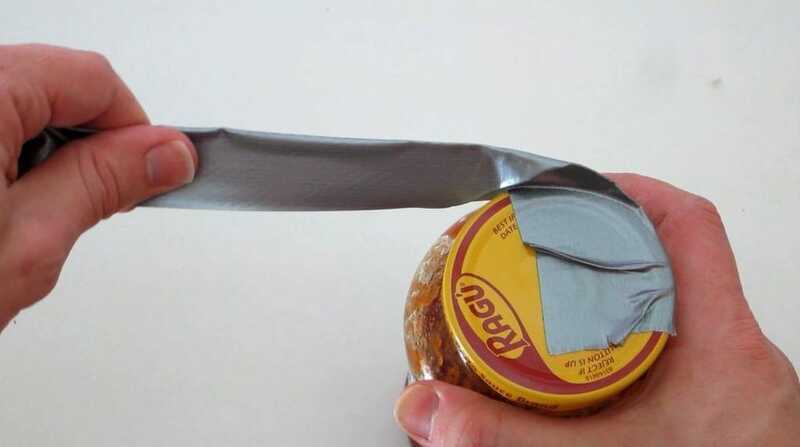 The leverage you’ll get from the duct tape should force open even the most stubborn of jars. You can thank us later! Anyone who’s ever owned a pet knows this problem. While cats and dogs are extremely adorable, there’s one particular problem that pet owners can’t seem to avoid – hair shedding. Some breeds shed insane amounts of hair all over your home, and you’re left with hairy sofas, clothes, and carpets. Cleaning those hairs is a pesky task, especially since your pet keeps shedding more and more hair. And while duct tape can’t keep your pet from shedding around your home, it can provide you with an easy way of cleaning fabrics that already have hair on them. Just put some duct tape on a roller and roll it all over your clothes – the hair will come right off. In life, we get ourselves in all sorts of sticky situations. The unpredictable things in life require us to think of truly creative solutions, and duct tape can certainly help with some of those. 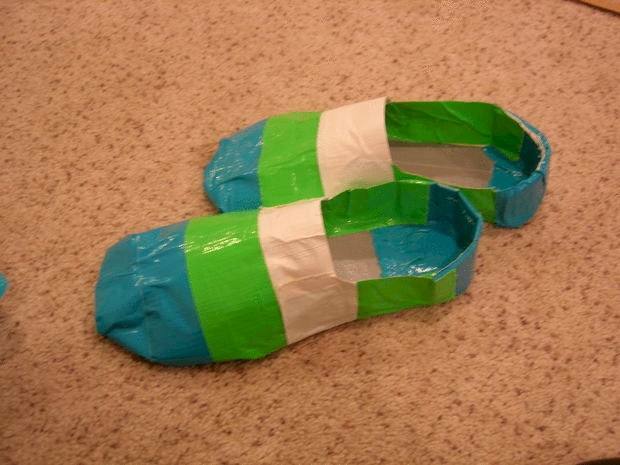 For example, if you ever find yourself in need of waterproof shoes, you can create makeshift shoes using thick paper and some duct tape. 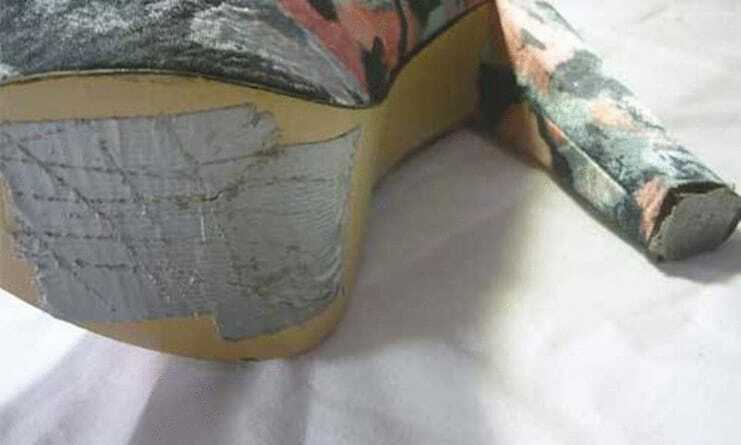 The duct tape will make sure water is kept out of your shoes and your legs stay dry. Having flies and other kinds of insects in your home can be really annoying. You try to prepare a meal and suddenly have something flying around and distracting you, or you sit comfortably in your living room and the buzzing won’t stop. If you’re experiencing this problem, there is a solution. 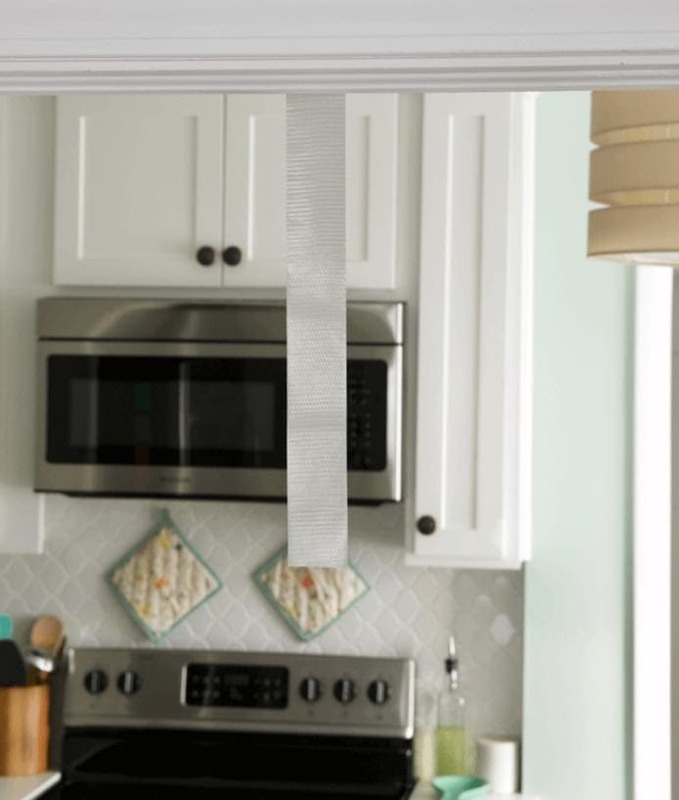 You can actually hang pieces of duct tape on your window, which might catch flies and insects as they try to enter your home and disturb your peace. That’s what you call brilliance, if you ask us. 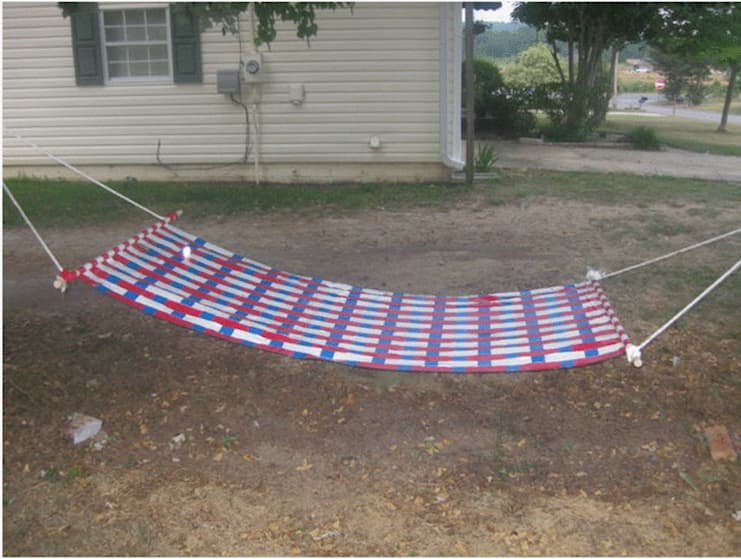 If you’ve always wanted a hammock for your back yard but couldn’t be bothered to get one, you can create one yourself using duct tape. Like shown in the picture below, just attach ropes to two sticks of wood, and tape it all together with duct tape until it’s secure. And there you have it – a hammock you can relax on out in the yard, while pretending to be vacationing in the Maldives or the Bahamas. You’re welcome! 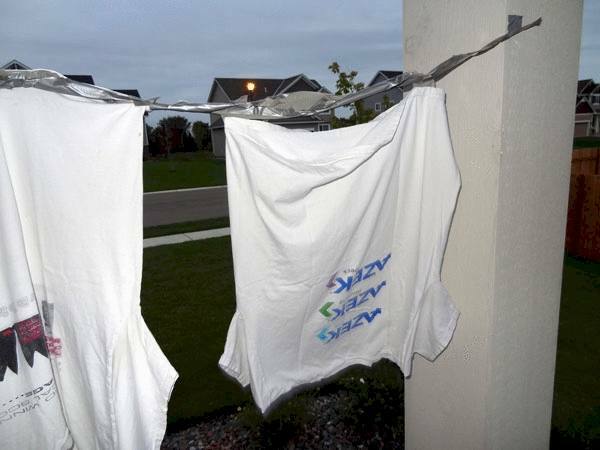 When you are vacationing somewhere, and need a place to hang your clothes to dry, or some laundry, you can prepare a makeshift clothes line rope out of duct tape. Just twist a long piece of duct tape and tape it to the sides of a balcony or inside the room. It’s actually strong enough to hold your laundry up, so it might be a great solution when you’re stuck without a place to hang your clothes. Granted, it’s not the most attractive of creations, but it’s still pretty cool. No more sulking about not having a fancy car with a cup holder inside. 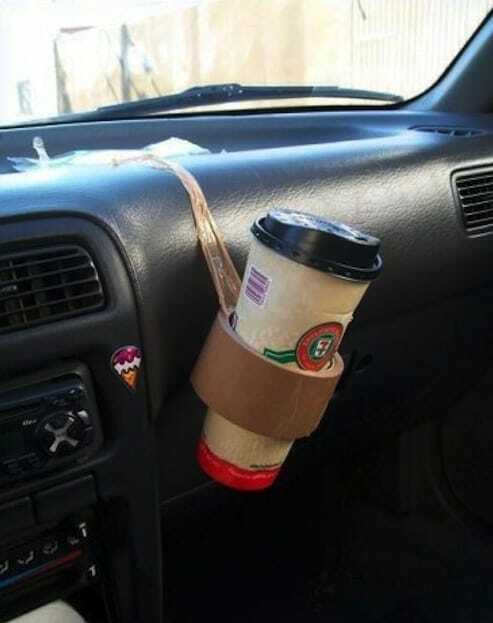 You can use duct tape to create your own – just put the cup inside and use a piece of duct tape to attach it somewhere in the car. You might not get the fancy car you’ve always wanted, but you’ll get the convenience of not having to hold your cup while you drive. This is a great solution for a common problem many people have. Some outlets are close to the floor and are located where there’s isn’t a night stand or table around. So when you want to charge your phone, you have nowhere to put it but the on the floor. 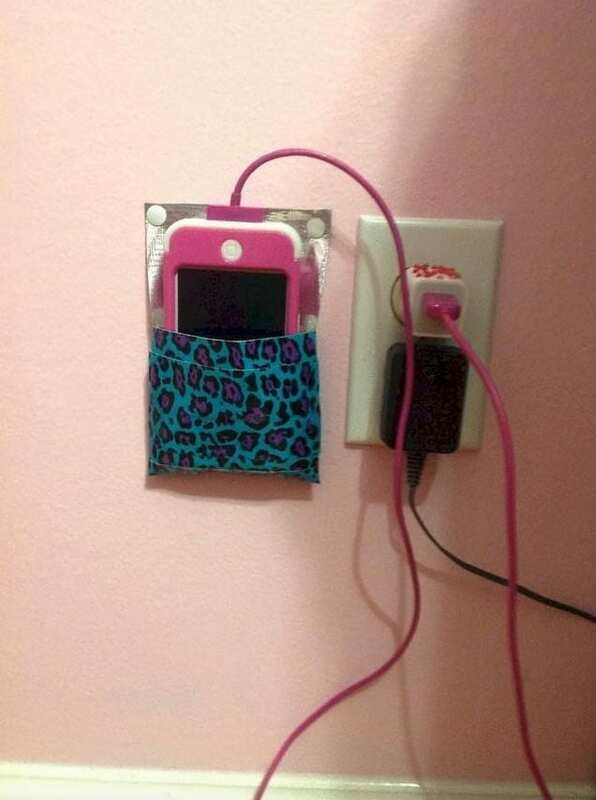 If you don’t like having your phone on the floor (with the danger of accidentally stepping on it), you can make a docking station using duct tape, and either tape it to the wall or use pins to secure it. Having hardwood or parquet flooring in your house is beautiful, and really adds to the home’s overall look. But these surfaces are in more danger of getting scratches all over them, which is a real shame. 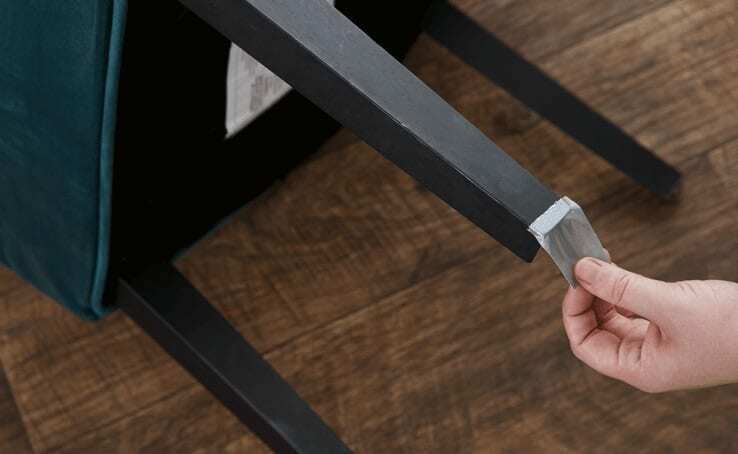 If you want to keep your floor looking flawless, try taping the bottoms of your chairs (or other household items that are in contact with the floor) with duct tape. This will provide a barrier that can prevent these scratches and marks from happening. Duct tape isn’t only practical – it’s also fun. In fact, you can actually use duct tape to make clothing items, which can be useful to making your own DIY costumes. From fake thigh-high boots, to fake vinyl suits, and even hero masks – duct tape is a fun and easy way of creating costumes instead of buying them. If you’re only going to wear them once a year, why not save up on it and make it yourself? Sitting in your patio is a great way to relax and enjoy the evening breeze with your family. But outdoors furniture aren’t very comfortable to sit on for long, as they’re usually made of plastic or wood. On the other hand, keeping pillows and cushions outside isn’t great either, because if it rains, they will get wet and possibly even ruined. 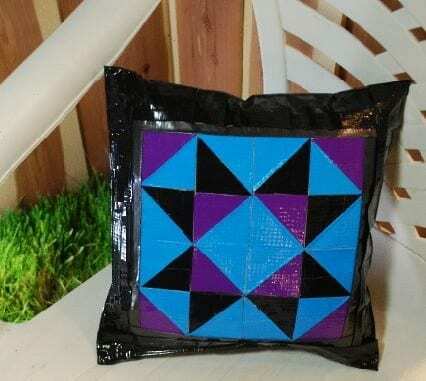 But using duct tape, you can waterproof your cushions and even make it look great using different colors! Many types of housework involves using caulking tubes, but how do you keep them closed and sealed after you use them? 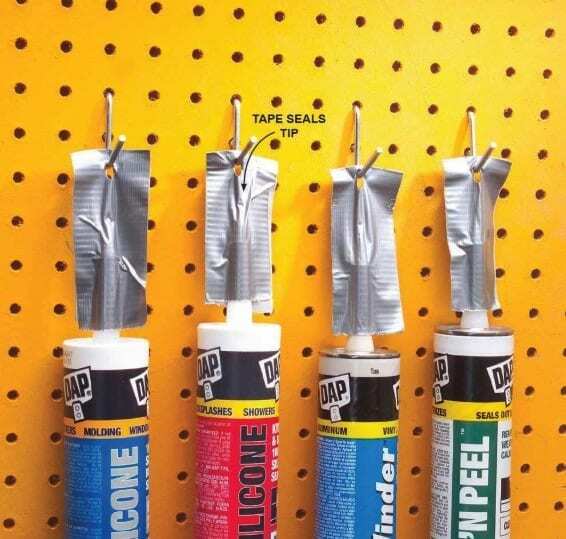 Well, apparently you can not only use duct tape to seal them properly and keep them from leaking, but also use it to hang them up on hooks in your garage. So not only will they be kept sealed shut, but you’ll also never lose them – and it’s far more esthetic than having them just lying around. 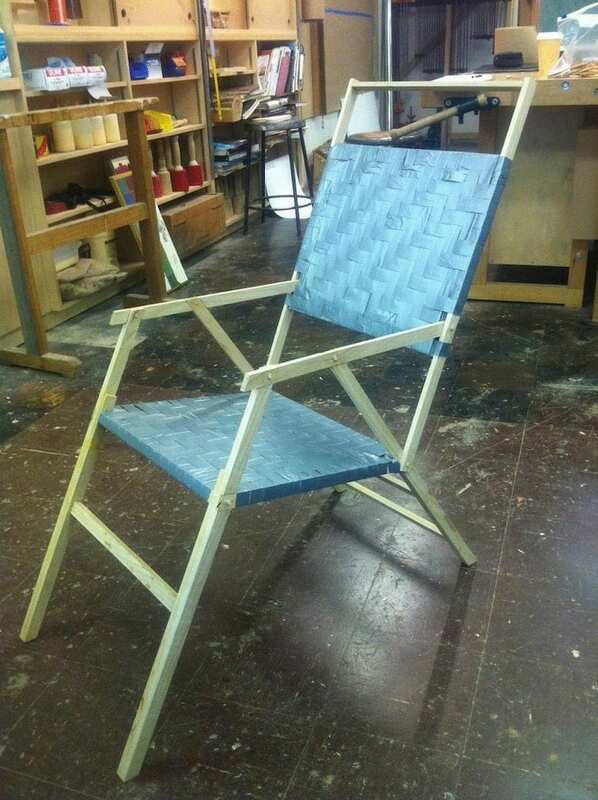 Another helpful use for duct tape is constructing a chair out of a few sticks of wood. You can make a chair quickly and easily outdoors when you’re stuck with not enough chairs to go around. It may feel a little less secure than a regular chair, but if it’s placed on grass or on a sandy beach, it’s as good as any old regular chair. You can also use it to coat wicker chairs to avoid getting splinters. Duct tape isn’t just helpful, it can actually save lives. If you’re out camping or hiking, you should probably keep a roll of duct tape in your bag. You never know when you might need it. 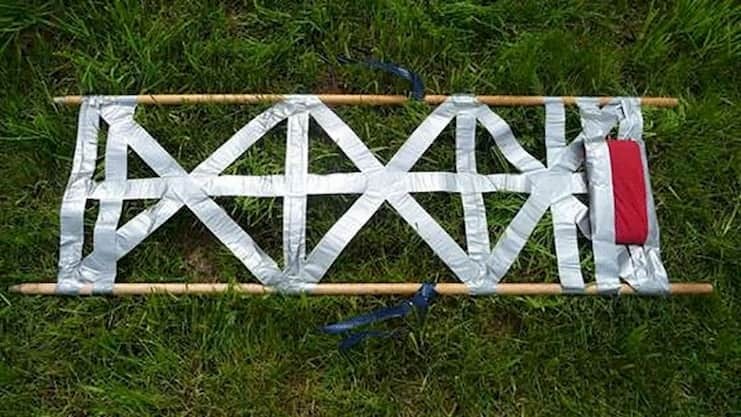 For instance, if someone is injured and needs to be carried, you can actually make a stretcher out of duct tape and sticks of wood you can find anywhere. It can be a life saver in cases when the person injured needs to stay horizontal until you get them medical help. Playing outside can be a lot of fun. Getting splinters from wooden objects while playing? Decisively less fun. If you or another family member get a splinter and have no tweezers around, don’t stress. You can actually remove it with duct tape! It sticks well enough to be able to pull out things from the inner layer of the skin, so while it may take a couple of tries, eventually you’ll be able to remove the splinters with relative ease. Most people really love traveling, but spending time in airports isn’t quite as fun. When your flight arrives you have to stand there with a huge crowd and look for your luggage before someone else grabs it, thinking it’s their own. 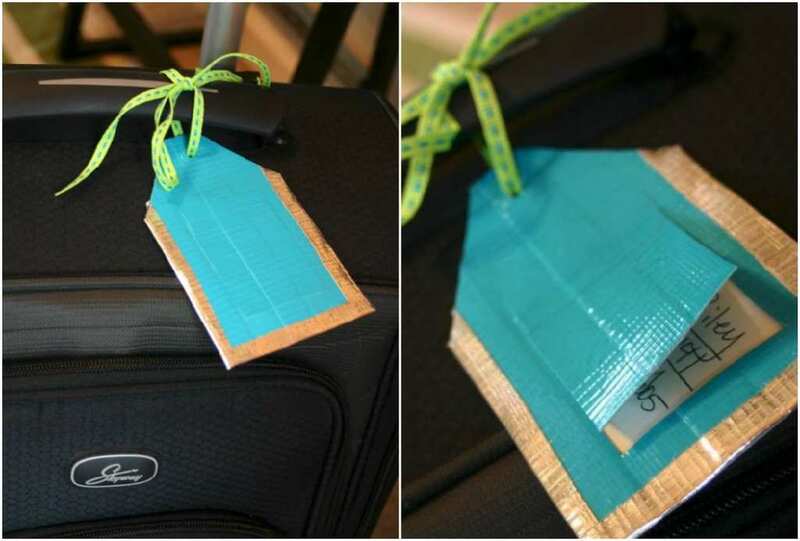 So if you want to tag your suitcase so you can see it from miles away (and have no one else confuse it with their own), you can use duct tape to make a beautiful luggage tag. Problem solved! Besides all the different DIY crafts you can use duct tape for (and there are plenty), you can also create straight-up art using the helpful material. This guy, for example, created the video game villain Bowser in the entrance to his parking garage, using nothing but duct tape. 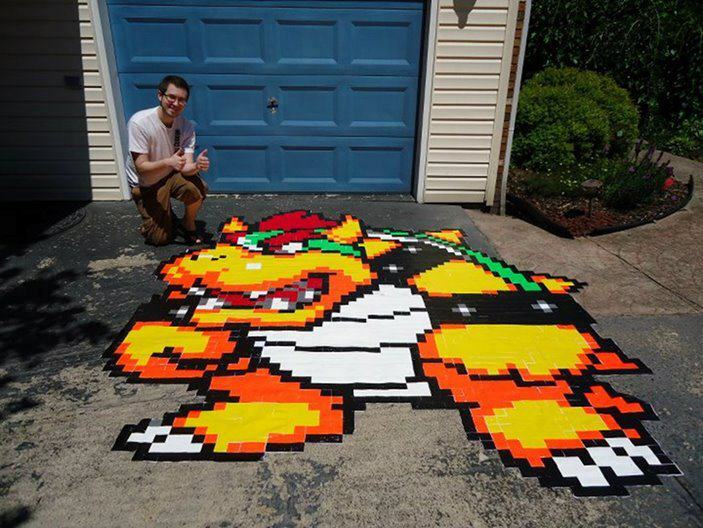 Art can take many forms, and we’re seriously impressed by this particular one. There are many beautiful things you can create with duct tape – even pictures and sculptures. Just go wild with it! It can be annoying when you’re going somewhere and don’t have a pocket to put your phone in. This happens to women all the time when they wear dresses, and carrying a purse around isn’t the ideal solution. So if you need a place to carry your phone (and even conceal it), you can tape it to your thigh with duct tape. This way you’re hands are free, and you know you won’t forget your phone anywhere. Cleaning out your gutter is a chore many people find both tiresome and irritating. You have to find a way to reach the gutter that’s way up high, and be able to clean it properly without seeing it. A gutter cleaner can usually make your life easier, but if you don’t have one – you can make one out of your leaf blower. 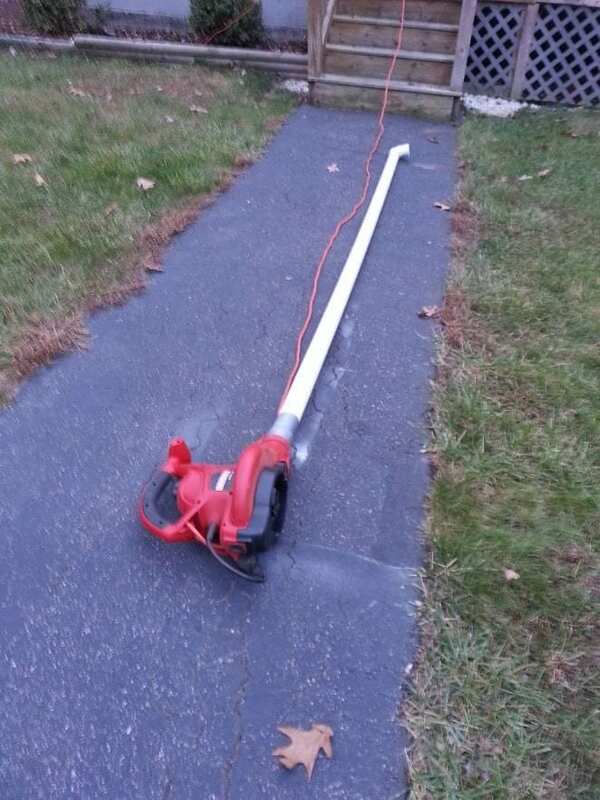 If you duct tape a few PVC downspout pipes to the leaf blower, and it should blow clean your gutter to perfection.